The life and times of one not so average guy..: Some recent baking fun.. So I had a bit of fun this past Friday and Saturday. I had friday off work and I volunteered to make some desserts for a Worship team meeting Saturday. I also had told a friend that I would make a little something special for her since she had missed out on the last time I made some sweets! I decided that for the meeting I would make a Key Lime Tart so friday morning I made my short dough for the tart as well as the custard. Unfortunately I didn't get the play-by-play pictures for that simply because I didn't even think about it. 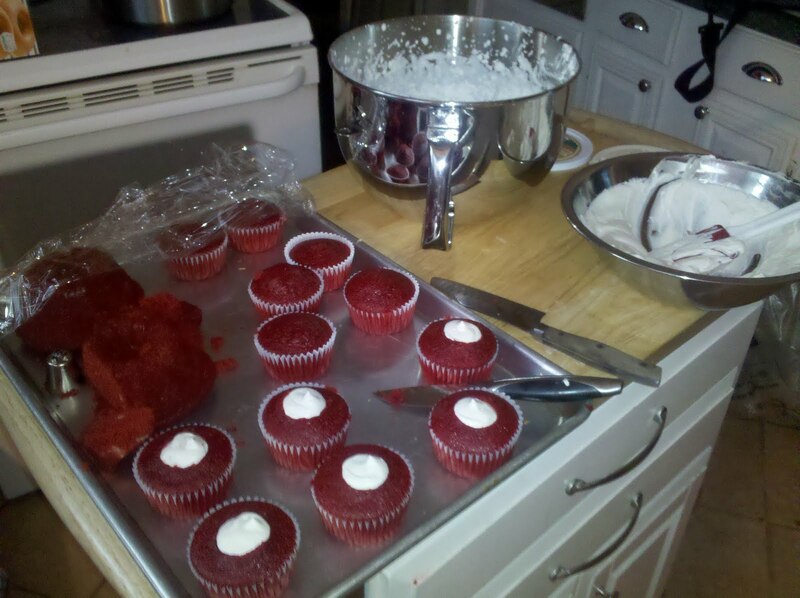 But Friday I made the tarts, and made Red Velvet cupcakes and a small cake as well. My friend would receive the cupcakes and my family would keep the cake. So friday I made three separate key lime tarts, a dozen red velvet cupcakes, a red velvet cake, as well as a American buttercream to go with the red velvet. About 1pm I get a call from work saying that they needed me for the night. I didn't want to go in because I was having fun, and I had dinner plans with my family for Norfolk's Restaurant Week. I was excited to go to that, but I decided to go, not only does it get me brownie points with my bosses there, but also extra money to have for PORTLAND AND ALASKA! So friday night was busy, and come saturday morning I wake up semi-early and finish what I had started, so this is where I decide to do the play-by-play pictures for fun and a cool blog post. I want to do more of these, I like it. 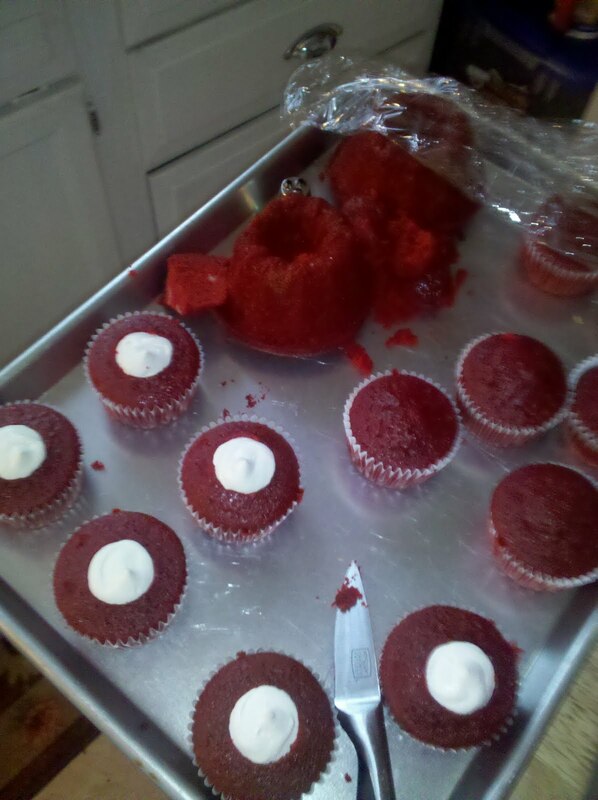 So here I took the cupcakes I made the day before and split them up. 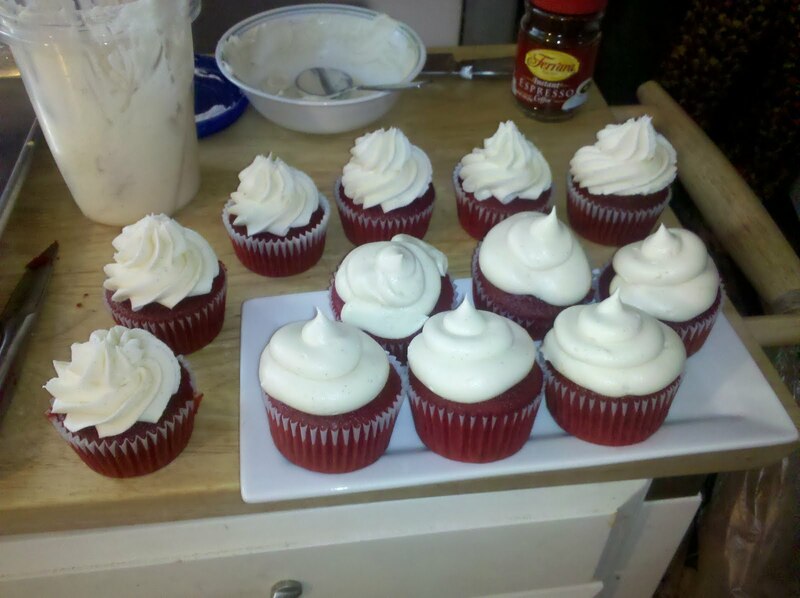 I was going to keep six of them a regular Red Velvet cupcake, and the other I filled them with a Tiramisu Mascarpone Whipped Cream. 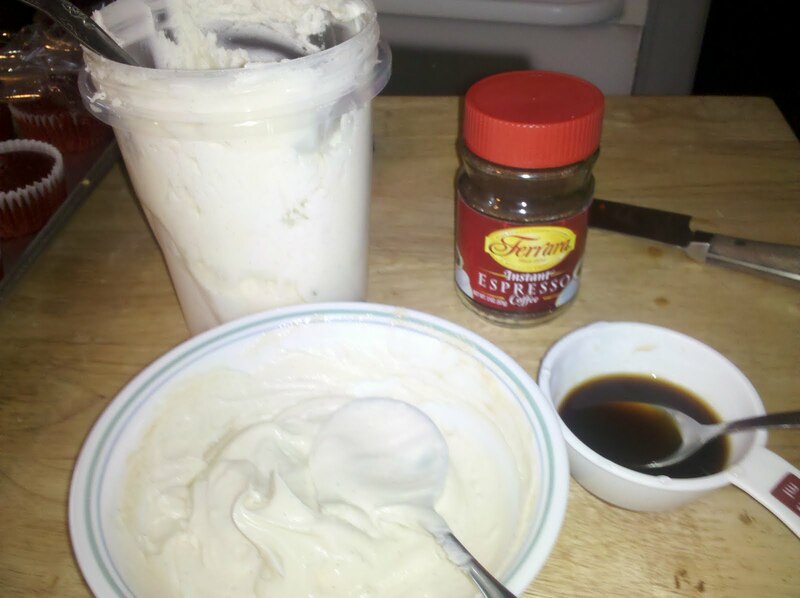 I didn't stop with the filling, I brewed some espresso and added it to some the buttercream I had made and topped the cupcakes with it. A coffee buttercream? YES PLEASE! was so smooth and creamy. It went really well with the Red Velvet cake. I was happy with the outcome. Here is a finish Key Lime Tart. I had three different sized tart pans, this the large, the medium went to my family's church Chili/Soup cookoff (In which my little sister won Best soup!) and the small was for US of course!! Overall I had a fun weekend, I really do love to bake, and I try to practice any time I get! Next I'm thinking some breads, and working with Choux Pastry! Don't worry, if you don't know what Choux pastry is I'll have a post about it soon!